MOOER has unleashed a brand new multi effects processor which delivers unparalleled amp modelling in its price range and an amazing array of effects and features which will surely impress even the most disconcerting of tone chasers. The GE200 has been designed from the ground up to be the musicians perfect partner. Be it live on-stage, in the recording studio or back home in the practice den. 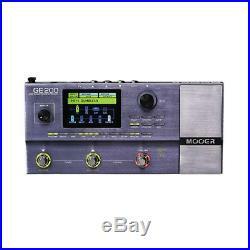 GE200 houses 55 amplifier models which utilize the same cutting edge technology as MOOERs hugely successful range of MICRO PREAMPS. These digital amp models will completely recreate the tone, touch and feel of their real-life counterparts. 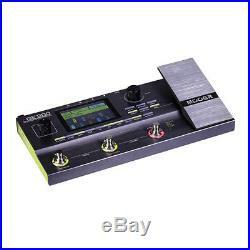 This mini floorboard contains an entire array of high quality digital effects. Including Compressors, drives, noise gates, EQs, modulation, pitch, filters, delays and reverbs. The effects signal chain is fully customizable within each preset allowing each of the individual effects blocks to be internally routed in any order. The 3.5 full colour display makes viewing the UI an absolute pleasure and programming presets is as easy as 1, 2, 3 using the effect blocks dedicated edit buttons. The built-in expression pedal and 3 brightly lit footswitches provide full control over the GE200 for rocking out live on stage. Providing real-time adjustment to some very special control options like the MERGE feature, which opens up limitless creative possibilities. The integrated 52 second looper with half-speed and reverse effects, team up well with its optional drum machine and auxiliary input for practicing songs at home with the same sounds you will use live at the gig. Connect GE200 to a PC via USB to record directly to your DAW. With fully configurable outputs and monitoring, GE200 can be the main hub at your home guitar studio. All of this is housed in a sleek, brushed aluminium shell which looks fantastic in the home or studio and provides a heavy-duty roadworthy chassis for taking on tour. 55 high quality amplifier models. 26 IR speaker cab models and added support for 3. Including Compressors, drives, noise gates, eqs, modulation, pitch, filters, delays and reverbs. 52 second looper with half speed and reverse effects. Drum machine with 40 drum patterns and 10 metronome rhythms. Store and recall up to 200 Presets. Adjustable signal chain lets you arrange the internal effects how you like. USB connectivity for PC editing and direct audio recording to computer. Programmable outputs for easy integration into any live setup. Auxiliary input and dedicated headphone output for audio playback and totally immersive practice sessions. 297mm X 145.5 mm X 45.5 mm. Owners Manual, AC adapter 9V DC, USB CABLE. The item "Mooer GE-200 Multi Effect Floor-Board Pedal Packed with Features NEW" is in sale since Monday, May 14, 2018. 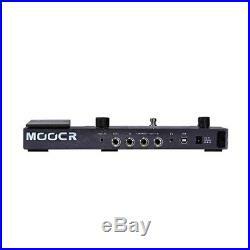 This item is in the category "Musical Instruments & Gear\Guitars & Basses\Parts & Accessories\Effects Pedals\Delay, Echo & Reverb". The seller is "pete-jacki" and is located in Brantford, Ontario. This item can be shipped to United States, all countries in Europe, all countries in continental Asia, Canada, Mexico, Brazil, Australia.